The 2012 Sara Hardy Downtown Farmers Market season begins on Saturday, May 12. The market will run on Saturdays through October 27. The Wednesday market will begin on June 6 and run through September, with a short break during the National Cherry Festival. The Saturday market will now start at 7:30am to Noon, and Wednesdays starting at 8am. The Sara Hardy Farmer’s Market is located in the parking Lot B, across from Clinch Park on the Grandview Parkway in Downtown Traverse City. The Sara Hardy Downtown Farmers Market continues to emphasize home grown products from the local area. Over 100 vendors and tens of thousands of patrons each year make the market the largest in Northwest Michigan and the best place to find locally-grown produce. Products available at the market include artisan bread, flowers, plants, fruits, vegetables, honey and eggs including some organic products. For more information on events in Downtown Traverse City visit their website at DowntownTC.com or call 231.922.2050. For a map of the Downtown area visit our Attractions page. The 2008 Sara Hardy Downtown Farmers Market season begins on Saturday, May 10. The market will run on Saturdays through October, with a short break during the National Cherry Festival. 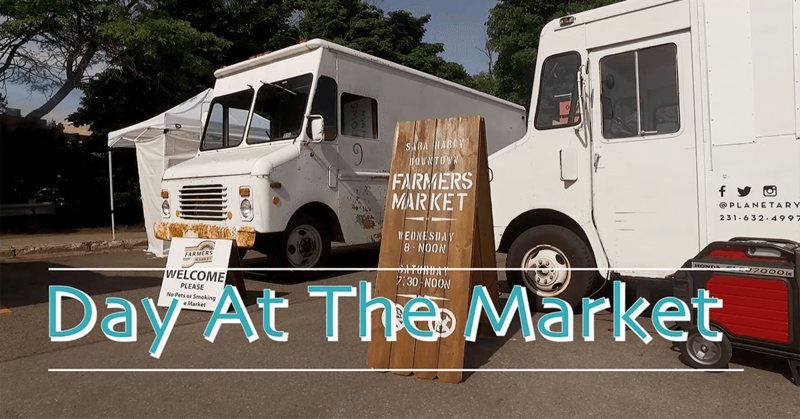 Over 100 vendors and tens of thousands of patrons each year make the market the largest in Northwest Michigan and the best place to find locally-grown produce. Products available at the market include artisan bread, flowers, plants, fruits, vegetables, honey and eggs including some organic products. For more information on events in Downtown Traverse City click here to visit their website. For a map of the Downtown area visit the Attractions page.